With so much to see and sip, it’s impossible to cover all the booze-splashed ground of Tales of the Cocktail, though I do my best. This year’s nearly week-long drinks and spirits conference seemed especially concentrated, but also spread out at the same time. Seminars, tasting rooms and special events were scheduled simultaneously throughout each day, with more competing events and dinners in the evening. Amidst the chaos, it can be challenging to identify a theme or trend. The modern cocktail renaissance is by its very nature steeped (or pickled?) in new ways of old drinking, but this year seemed more so than usual, as seminars focused on new research about classic drinks (and also how not to kill yourself and others making them), new brand presence with more attention to finer authentic details and new releases of older (as in maturity) spirits in general. One of my favorite parts of the day is tasting new spirits and meeting the people behind them. It was a pleasure to finally make the acquaintance of Francesco Amodeo of Don Ciccio & Figli. He specializes in liqueurs from authentic Italian recipes, though using American fruits, botanicals and other ingredients sourced via his adopted home base of Washington, DC. The nocino, aperitivo and various styles of amari are especially impressive and could easily satisfy any purist of these spirits. Pro tip - the nocino splashed into chicory iced coffee from Café Beignet. The authenticity of their spirits was highlighted even more in comparison to Saturday's transportive Spirit of Italy Brunch Italiano with amari, liqueur and vermouth from the likes of Luxardo, Pallini, Cocchi, Varnelli, Strega, Lucano and Nardini. Other tastings included a delightful snapshot of Oregon craft spirits, featuring Ransom (profiled here this spring as true protectors of the old craft), Pacific northwest pioneers Clear Creek, Elixir (more American-made liqueur Italiano), House Spirits (celebrating 10 years of Aviation Gin) and Oregon Spirit Distillers. My bicoastal Brooklyn neighbor, Andy Ricker, even flew in to promote Pok Pok’s deliciously addictive drink mixers, including the sipping vinegars (think shrub, but more savory and alluring). Combining analog cocktail culture with digital advancement, the Sazerac Company took this opportunity to introduce its new website based on the Mr. Boston Official Bartender’s Guide. The book itself (Mr. Boston was a brand of spirits that published the original guide in 1935 in the wake of Prohibition) is a treasure of information that is still relevant for any type of drink mixer, but the digital platform expands the knowledge with more convenience, offering expert tips on bar basics, history and spirits with options to search via occasion, ingredients and even type of glassware. The site, still in its early stages, will include articles from noteworthy drink authors and eventually users will be able to contribute their own drink recipes. The cocktail movement has inspired many a home bartender to try things at home, though sometimes this can result in disastrous health and safety practices. Writer Camper English, of Alcademics, known for his coverage of some of the more science-y aspects of spirits and cocktails, and Avery Glasser, founder of Bitterman’s Bitters, led “The Roof is On Fire! 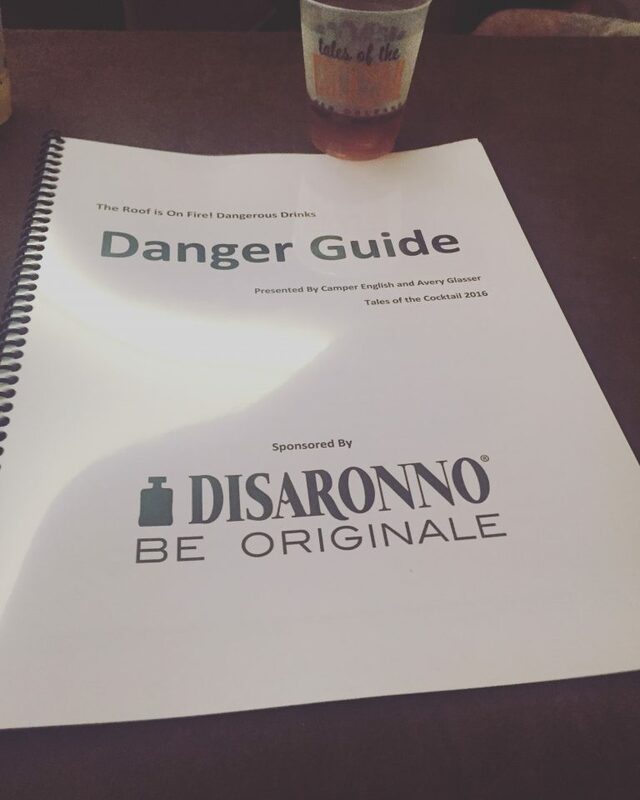 Dangerous Drinks” seminar. This talk not only discussed a bit about fire safety (though mostly with a hilarious slide show of drinks gone wrong from the internet that was projected prior to the main presentation), but more importantly, it focused on not-so-obviously-toxic ingredients or those that could at least result in some uncomfortable itching. Now that practically any botanical can be sourced online, almost none of it comes with a warning label, yet a proliferation of amateur infusion and bitters recipes still rather irresponsibly call for them. For instance, homemade amaretto recipes require an infusion of bitter almonds. Sounds innocent enough, except “bitter almonds” are not really almonds like the ones we eat, which are technically seeds and not nuts. Bitter almonds are the dried seeds of stone fruits like peaches, cherries and apricots which have to be professionally distilled (as in Amaretto Disaronno) in order to avoid cyanide poisoning! Think fat-washed spirits like bacon bourbon are yummy? Hope you’ve refrigerated the infusion during the process to avoid meat spoilage… English and Glasser even compiled a handout, the Danger Guide, listing many popular ingredients and their allergy-inducing or potentially poisonous effects, even pointing out the differences between related items like cinchona bark and quinine when making home tonic water. Safety first, drink nerds! One person who is well practiced in the art of the drink, and certainly knows his quinine from his quinidine, is drinks historian and Sipsmith master distiller Jared Brown. Gathered on the roof above John Besh’s Pigeon and Prince, Brown hosted a multinational group of skilled bartenders for Game of Throws - the ultimate challenge in the all-but-lost art of throwing drinks. Throwing a cocktail, that is, mixing it by transferring the liquids between glasses from an extended height, does a better job of aerating aromatic ingredients such as vermouth by creating more elegant and precise bubbles than conventional stirring and shaking. However, it takes quite a bit of practice not to aromatize one’s own shirt instead. Not only was this an entertaining bit of theater in both verbal presentation and action, but guests were also treated to some delicious Sipsmith gin drinks while they watched the fun. Sir Stamford Raffles). The gin itself is a beguiling concoction that differs from London Dry, at the time a style that was not available in Singapore, with a botanical mix that includes pandan grass, makrut (the more PC name for “kaffir”) lime leaf, cardamom, jasmine, lemongrass, pomelo peel and other regional aromatics. The presentation traced the history of the Singapore Sling from before the invention of that drink to its parent, the gin sling, to its creation and original Raffles recipe, which was simply gin, lemon, cherry brandy (specifically Cherry Heering), Bénédictine ,and topped with soda and orange peel garnish. However, because world traveled cocktails often reach their destinations like a game of Telephone, the most familiar recipe that stuck, adding powdered sour mix and canned pineapple juice “...could not be more disco if it came out in gold lamé pants and rollerskates.” These days both versions of the cocktail are served at Raffles, though with a more sophisticated, fresh ingredient pineapple sour iteration, but head to the Writer’s Bar if you want the classic recipe served with Sipsmith 1915 Raffles gin. Rounding out this year’s fest, having spent a week on my feet in the heat and ready for the home stretch, I had the unusual, if not somewhat outer body experience, of riding around downtown New Orleans with Macallan brand ambassador Raquel Raies in a Bentley while sipping the Rare Cask release, named thus because a large portion of the casks in which the whisky was aging come from Spanish sherry bodegas that are no longer in operation. After a smashing dinner with friends at Compère Lapin, where between a large group we tasted almost everything on the food menu (while most of us opted for low ABV drinks or nothing alcoholic at all), I re-entered Macallan land for their Nite Cap event. Here I met up with Adam so we could divide and conquer, able to taste all the other expressions of Macallan’s 1824 Master Series - Reflexion, No. 6 and M (the latter two packaged in Lalique crystal decanters). As the rest of the troops met again in the hot sun in the Marigny for Pig n Punch and with only a couple of hours till my flight home, I was ready to pause for reflection and one more taste of the city’s superb cuisine. This called for a Brandy Milk Punch at Broussard’s, a jazzy brunch with friends who don’t mind sharing bites off their plates and yes, we had to, because when burning in Rome, Bananas Foster flambéed table side. What’s old is fondly repeated again indeed, maybe better this time round. That’s why they call them “classic,” after all. You think it’s hard to organize an article around this? Try putting it all together! Thanks to Ann and Paul Tuennerman for making it happen, and all the CAPS for their utmost professional assistance in the events and seminars. Cheers, y’all!